Billy Crystal and Josh Gad star in a hyper-realistic comedy show about them trying to start a comedy show. Think Curb Your Enthusiasm meets Inception. I only say that because it’s a show within a show. The style resembles Curb Your Enthusiasm and Louie. The premise is that Billy Crystal and Josh Gad are both trying to start the next thing in their career when they reluctantly get matched up to start a modern-day variety show with one another. 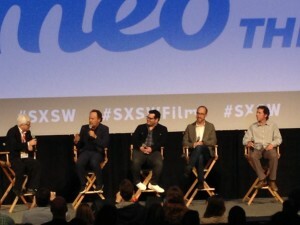 I had a chance to see the first two episodes at a special SXSW screening, followed by a Q&A. Interestingly enough, The Comedians is based on a Swedish comedy show called Ulveson & Herngren, which stars two popular Swedish comedians in the same predicament. Billy Crystal mentioned that he was sent some episodes of the Swedish series and was cry-laughing within the first few minutes of the show and didn’t really know why, he just knew he loved it. I had never heard of Ulveson & Herngren before, and I didn’t even know The Comedians was based on anything else, but I am glad it came to America. I am especially glad that Billy Crystal and Josh Gad were cast. Billy Crystal was probably one of the first people to make me laugh, with Saturday Night Live, The Princess Bride, Throw Momma from the Train, When Harry Met Sally, City Slickers, Analyze This, Monsters Inc., and everything in between. Honestly, when I saw him in the series trailer, I already wanted to watch the show. Then, I saw Josh Gad standing next to Billy Crystal and I was even more intrigued. I first remember seeing Josh Gad in The Rocker, but since, I’ve enjoyed him in Thanks for Sharing, Jobs, 1600 Penn, The Internship, Frozen, and New Girl. He is also known for his incredible performance in the Broadway musical The Book of Mormon. Side note – Josh Gad laughs at himself for 1600 Penn, a show that Josh created and starred in, that was never renewed after the first season. I just wanted to go on record saying I frickin’ loved that show and it was one of the few shows that my boyfriend and I enjoyed watching together. If you’re reading this Josh, there were people who watched and loved it. One series does not a failure make. Freaks and Geeks was only one season and people loved that series too. But I digress. The Comedians gives off almost an Odd Couple vibe, with two complete opposites who desperately need each other. Billy Crystal is a veteran, he’s established and successful, but still hungry for work. Then Josh Gad shows up, completely loveable and very green, all the while throwing verbal daggers at Billy without really knowing he’s insulting him. He plays the loveable idiot who often makes heartfelt apologies for his idiocy. During the Q&A, Billy and Josh mentioned that these characters are extremely exaggerated versions of themselves, and let’s hope so, because they say some pretty hurtful things to each other. They also make digs at themselves. I found the first two episodes hilarious and awkward at the same time. I didn’t know whether to laugh or cringe at most of the show, and I mean that in the best possible way. The mixture of physical and verbal comedy, the documentary-style shooting, the pacing – it all works, and it definitely works for FX. You must check out the first few episodes and see this awesome duo! They are in the perfect home, preceding Louie on Thursday nights at 10/9c.